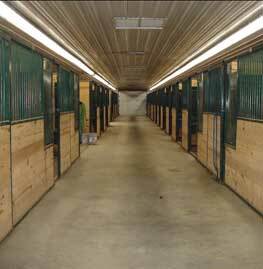 Boulder Creek has 75 heated stalls of various sizes to meet the needs of the horse. We also offer daily turn out for the stalled horses. We have two large pastures, a mare pasture and a gelding pasture, 12 paddocks, and 6 dry lots. The fences are kept in good condition. Boulder Creek offers both stall and pasture boarding. Stall boarded horses are fed and watered twice a day and the stalls cleaned once a day. Stall board includes a stall that is cleaned once a day and high quality hay to suit your horse's appetite! We feed Purina Strategy and grass/alfalfa hay grown to our specifications. Stalls and water buckets are cleaned daily. Horses are are turned out as frequently as possible based upon the weather and health of the horse. It is your decision as to how much your horse is fed, however we will make suggestions if requested or if we see a needed change. We also have direct access to Equine Nutrition Specialists who can provide an assessment and feeding program tailored to your horses needs at no cost to you. There is no extra change for feeding owner supplied supplements or medicines. Temporary board including feed, bedding, stall cleaning and limited use of the facility is $30.00 per horse per day and must be coordinated and approved in advance. Temporary board in the show barns includes only a stall and limited use of the facility for $20.00 per horse per day. We look forward to the opportunity to serve you and your horses needs.